Hey Guys! Welcome to another Top 5 Thursday! 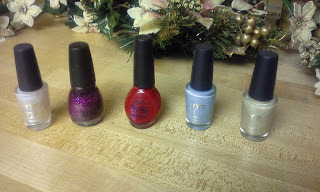 This week I am going to tell you my top 5 favorite winter nail polishes! I tried really hard to do a variety of brands but for some reason this one ended up being mostly NYC! I do feel bad though because I think most of these are limited edition polishes. If you are interested in them though, I would do a search on Ebay or Amazon for them because I did find most of them there! The first one is actually a top coat but it is perfect for winter and will make all of your polishes winter polishes. 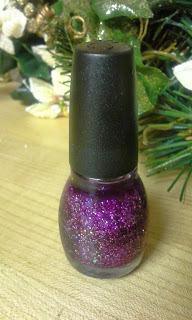 It is the NYC sparkle top coat in Shimmer blast. It is really hard to see in this picture, but this is full of little multi-colored shimmers. It just kind of reminds me of snow. I love this stuff! The next one is Sinful Colors. This is a beautiful purple polish filled with big pieces of silver and multi-colored glitter. It is #930 and it is called I Miss You. 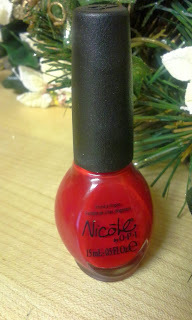 This red Nicole by OPI polish is the PERFECT red. It is just a really wonderful true red. I actually earned this nail polish by eating Kellogg's cereal! You can still earn this nail polish through the Kellogg's deal! This one is called Challenge Red-Y. I absolutely love this pale blue color. It just screams winter to me! This color is really opaque and creamy. This one is another NYC polish and it is called Raindrop. And lastly, another NYC polish! I love this one so much! It is a cream color with gold glitter in it. It isn't overwhelming with the gold glitter either, which I love. This one is called Enchanted. 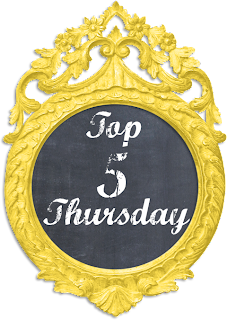 There you have it, my top 5 favorites for winter! What are your favorite winter nail polishes?